How to Read a Market Profile Chart? You are here: Home / Market Profile / How to Read a Market Profile Chart? Who should start reading a Market Profile chart? Market Profile is not a trading system but a market generated information and a decision support system along with your existing trading systems. It provides you knowledge about who is in control in the market (Long Term Players, Short Term Players, Day Traders), directional conviction. Market Profile gives an idea to a day trader about where to take a trade and which tend to play for the day based on trend conviction. Market Profile study is different from traditional technical analysis indicators. You need to unlearn lots of your so-called traditional technical analysis learnings before diving deeper into it. Like any other technical analysis studies, Market Profile consumes lots of time in learning. It requires at-least a live observation for 3 months and parallel reading is needed to understand what other market players are trying to do and how the pro traders and institutional players are driving the market. As a human trader, it often happens that we tend to see what we want to see and react based on limited information. Market Profile solves this perceptual blindness to some extent. Market Profile talks about how auction takes place in the market. Financial Market is all about two-way auction process where buyers and sellers both drive the price up and down. The byproduct of the two-way auction process is market-generated information. By reading the market-generated information one can learn who is in control in the market(Buyers or Sellers) and how much confidence they are in driving the prices higher or lower. It also helps a day trader to stay away from the retail style crowd play most of the time. Market Profile was developed by legendary CBOT trader Pete Steidlmayer in 1984. It shows where the auction of the trading instrument, explains where the crowd trades most of the time for the day, where trading volume is accumulated most of the time, where trading volume is minimal or absent. Market Profile is not a time-based chart rather it organized the trading data and charts the relative frequency of trading at various price levels. By organizing the trading data in terms of profiles (Alphabets) one can study the market structure and market dynamics. Typically Day profile is meant for Day traders where each and every day a free-flowing graphical format called profiles are plotted as shown above. Readings: How to Get Market Profile and Footprint Profile Charts? 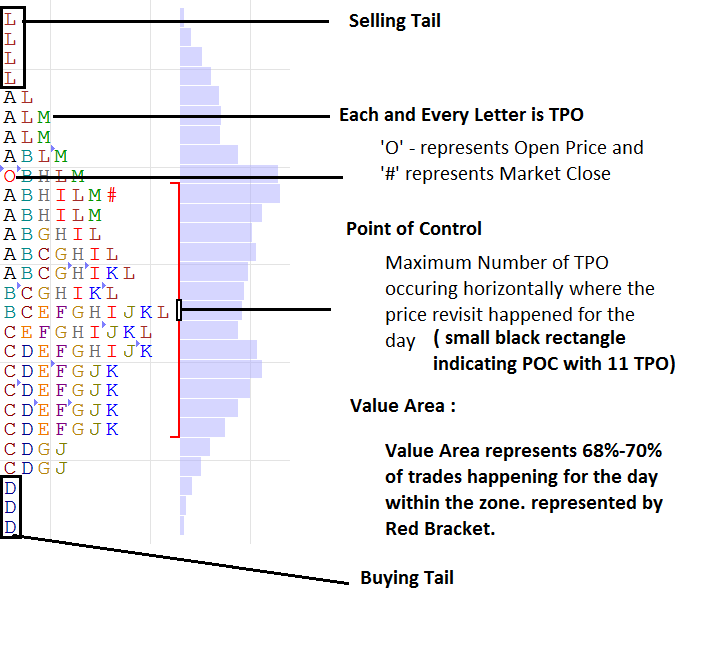 TPO – TPO or Time Price Opportunity is the basic building block of Market Profile. Each and every letter in the chart represents a TPO. Which in turn represents a point of time where the market touches a price. Each consecutive letter denotes a 30min period of Market Activity. In our example, as shown below the letter ‘A’ represents how the price traded for the first 30min. Letter ‘B’ represents the next 30min of activity. And Letter ‘C’ and ‘D’ represents subsequent market activity details and so on. TPO Size: Practically speaking we need to define the size of TPO to make sure that your entire profile is visible. Generally one can try in Nifty Futures with TPO Size of 3 which mean each and every letter represents a block of 3 points in Nifty Futures. And TPO Size should depend upon the Trading Instrument. For greater accuracy of Key reference levels, it is advisable to use TPO size as less as possible but with higher TPO Size more historical data can be seen and key reference levels out of range can be seen with higher TPO Size. Initial Balance (IB) : Initial Balance represents the first hour of trade. Typically the high and low range of the letters ‘A’ & ‘B’. Longer the length of the Initial Balance stronger the conviction of Long term and Short term players. Point of Control : Point of control is the price where most of the trade for the day happens. In other words the price where more number of TPO’s in a row. Todays ongoing POC levels are represented as DPOC (Developing POC) and Yesterdays POC (YPOC) and Previous POC levels are plotted as dotted green lines as shown above. Value Area : Value Area is the fair price zone where the Other Timeframe Players (Long Term players and Shorter Term Players) loves to trade in this zone. 70% of the day’s trading happens here. Value Area High (VAH) – The upper level of value area. (upper Red Bracket Level). YVAH – Yesterday’s value area high is marked as Red Dotted Line. Value Area Low (VAL) – The lower level of value area. (Lower Red Bracket Level). YVAL – Yesterday’s value area high is marked as Blue Dotted Line. Single Prints : When there is only one TPO in a Row. From the above picture you can identify that Letter ‘D’ and ‘L’ are single prints. Range Extension – An extension of price above or below the initial balance. High Value Node (HVN) : An HVN is a price area of high TPO count or volume. The market traded for a long time at this level. These often form support or resistance levels when the price re-visits the area. Low Value Node (LVN) : An LVN is a price area of low TPO count or volume. The market did not trade for very long time at this level. These often form support or resistance levels when the price re-visits the area. In the next section we will discuss more about types of markets, market participants and different profile patterns. Fantastic explaination rajndran. Made it easy by you. Very useful to people who are interested in Market Profile like me. We expect more from you. Thanks. i have gone through your mail spike and spike rules. as a common trader i find it very difficult to understand and analyse. give us very simple instruction. Just by reading the rules you cannot understand anything. Just experience it practically. Foremost start reading with Market Profile and get comfortable with the basics! Will Market Profile be covered in the Sep ’15 Workshop ? Thanks. Planning to allocate 2 hours post in the evening. Need to check with interested participants. Where i can see these charts live real time ? Thanks for great post.I am trying to load the MP chart for my Multicharts version 9 trading platform ,found the indicator from below location which you have mentioned. But I am not able to get proper MP chart.Could you please help me to make proper settings to draw properly? Fantastic information……please keep on update………. HI! very good! Where Can I find this indicator of ninjatrader? Thanks! Could you please suggest any good books to understand in detail about Market Profile trading.